Dental implants replace missing teeth. You are able to restore your smile and feel just like you did when your natural teeth were present. 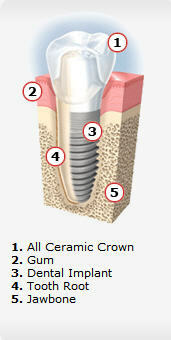 Implants can be used to replace single teeth or multiple teeth. Implants can even be used to hold dentures in place for a secure and comfortable feeling. Dental implants have a very high success rate and are chosen for the most natural-feeling alternative.